was our oldest and most famous warrior. He was a very peaceable, dignified, kindly gentleman. The last dance party for Oakland children held at the Oakland Hotel in the summer of 1907 under the sponsorship and tutelage of Mrs. Elizabeth (Aunt Libby) Hyde. The hotel was dismantled in 1909. Front row, left to right: Arthur Townsend, John Mitchell, Lyden White, Irvin Baumgartner, Mary Willison, ? ?, Ralph Robinson, ? ?. Second row: Regina Helbig, Lillian Helbig, ? ?, a Miss Linville, Elizabeth Mitchell. Third row: Cecelia Hart, Elizabeth Willison, Ruth Robinson, Margaret Sincell, ? ?, Mildred Dixon. Fourth row: Carleton Hinebaugh (sitting on post), ? ?, Emroy Bolden (with large bow tie), David Burke, Frederick Thayer (in dark blouse), and Genevieve Paddock (seated on post). Fifth row: Felix Robinson, ? ?, Lois Fraley, ? ?. Sixth row: Girl (seated on post), ? ?, Douglas Sincell (in large hat), Frances Hamill, Le Mark Ward, Isabel Hamill (seated on post). 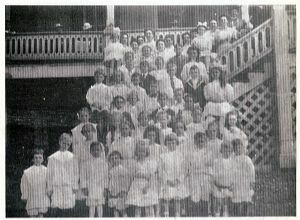 The last row: Mrs. Hamill, Mrs. White, Veronica Rasche (the tall one), Aunt Libby Hyde (third from last). Several on this row of adults not identified. Picture courtesy of Dr. Irvin Baumgartner.